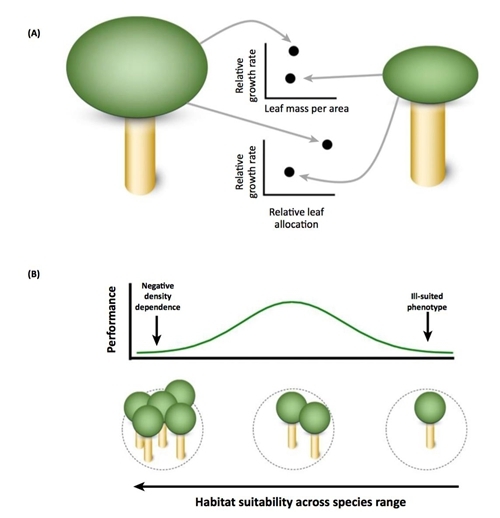 Functional trait is defined as a physiological or morphological trait that influences the growth, survival, or reproductive rate of an individual plant. While the popularity of functional traits in community ecology is clear, the relative success of ecologists attempting to link functional traits to demographic performance is questionable, particularly in tree communities. By consulting a large amount of literature, researchers from Xishuangbanna Tropical Botanical Garden (XTBG) and University of Maryland found evidence that functional traits often fail to predict demographic rates. The trait–demographic rate relationships are not as strong as often assumed or portrayed. They argue in Trends in Ecology & Evolution that the weak relationships arise from three fundamental problems with trait-based community ecology as it is currently implemented. They first stated that a trait with little context has little predictive power. The way in which a trait of an individual influences demographic performance is dependent on the environment as well as the other trait values of the individual. They then put forward that measuring individuals is challenging, but advised. “A tradition in functional trait ecology has been to average trait and demographic rate values at the species level for downstream analyses. Individuals, however, vary in their trait values as well as the environmental contexts that they occur in on the landscape. Averaging this information will obscure trait–rate relationships that could be elucidated by analyzing individual-level data. Utilizing species mean values measured from populations not in the study system that they are being applied to will further exacerbate the problem.” said Dr. YANG Jie, the first author of the study. “Specifically, important contextual information is frequently ignored, there is too much focus on species relative to individuals, and there are dimensions of tree function that are critical for determining tree demographic rates that are not captured by easily measured functional traits” said Dr. CAO Min, a researcher of the study.